As you hike along the trekking trails of Baba BudanGiri Hills, you will come across a beautiful waterfall, named Manikyadhara falls. Nestled in the midst of the Shola forest, this perennial water cascade is a pleasant break to quench your thirst after a long hour trek. Legend says, Saint HazratDadaHayath Mir Khalandarand his four disciples came to this place in search of water. As they could not locate any water source in the nearby region, they started praying god. Their prayers were answered and a waterfall was formed, flowing down the mountains. 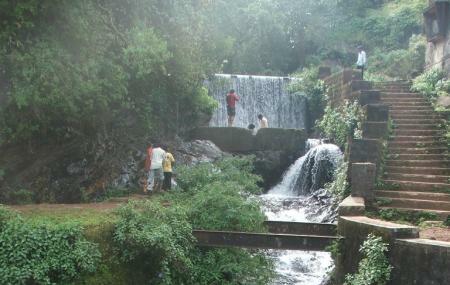 Till date, this waterfall is considered sacred by the locals of this region. Many people visit this waterfall to take a dip in the water. As they believe that the water has medicinal effects to cure various skin ailments. The best part of this waterfall is the temperature of the water remains cold throughout the year. Hence, if the scorching sun of summer makes you tired while hiking, you can take a sip of this cold water to cool yourself. Wear hiking shoes as you need to walk a lot. It is open 24 hours. However, it is best to visit during day time. By car from Chikmagalur till the base of Baba Budangiri hill. How popular is Manikyadhara Falls? People normally club together Baba Bundangiri and Deviramma Temple while planning their visit to Manikyadhara Falls. People also prefer to start their day with Manikyadhara Falls.